I love making pies. I first made this recipe a few years ago when we were living in Canada and it’s just as good as I’d remembered! To start, preheat your oven to 375 degrees. In a bowl, combine your 2 1/4 cups of flour and your salt. Cut in the shortening until your dough looks like crumbs. Now, add water a tablespoon at a time, mixing with a fork, until your dough starts to stick together. This took me about 12 tablespoons today, but I’ve found this to vary a lot. Make your dough into two balls. Flour your counter lightly. Roll out one of your dough balls until it’s about a foot in diameter all the way around. Line a pie pan (mine’s 9-inches) with this dough. It’s easiest to safely transfer your dough by loosely wrapping it on your floured rolling pin. Next, I rolled out the second dough ball and set it aside. 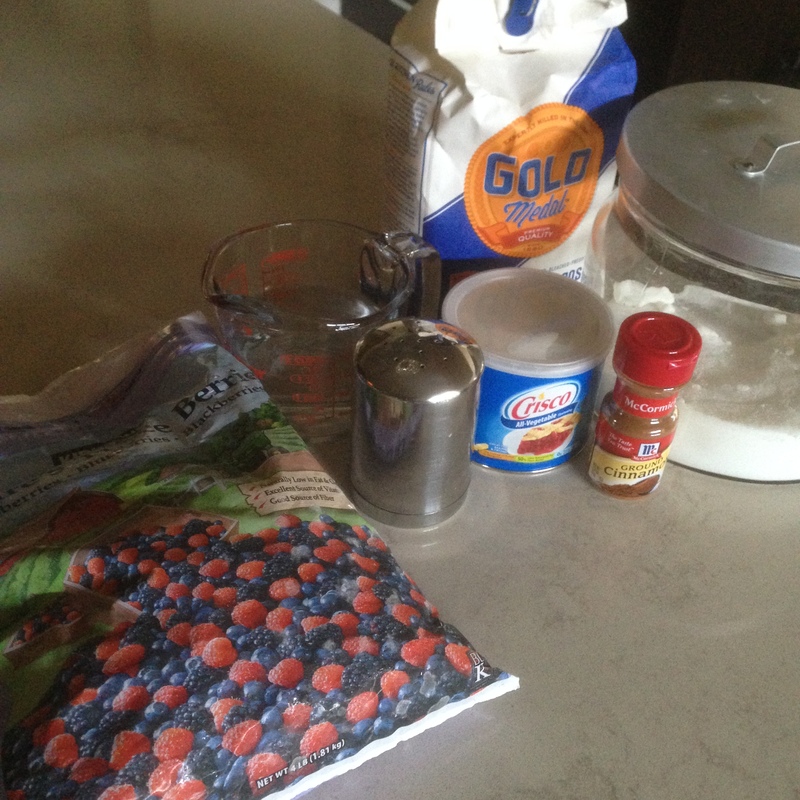 In a bowl, combine your berries, 1/3 cup flour, and 2/3 cup sugar. 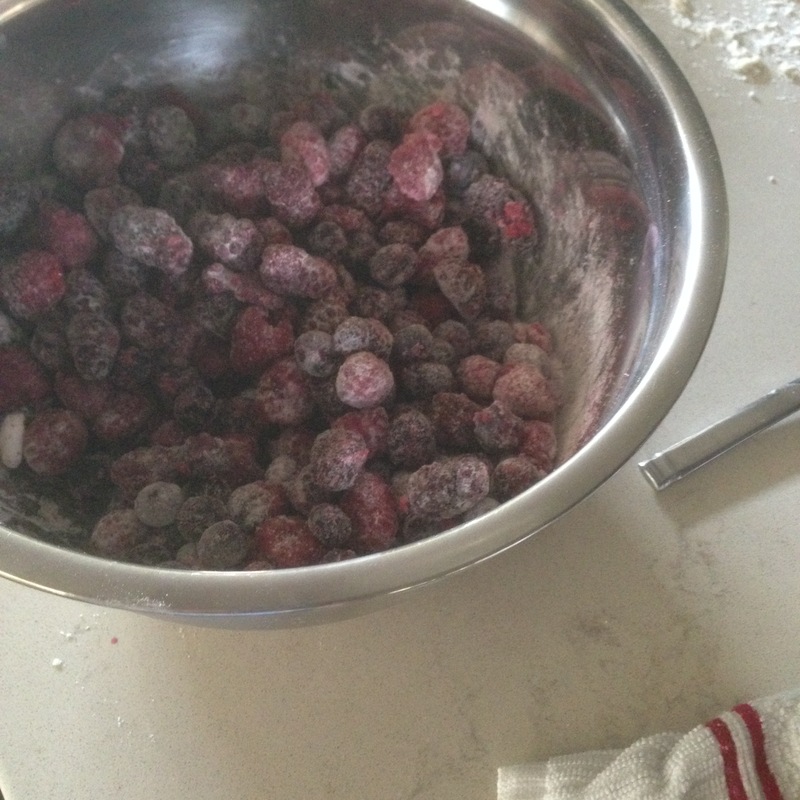 I let mine sit for about 30 min to thaw the berries and combine the flavors more thoroughly. Spread your filling into the pie pan lined with dough. 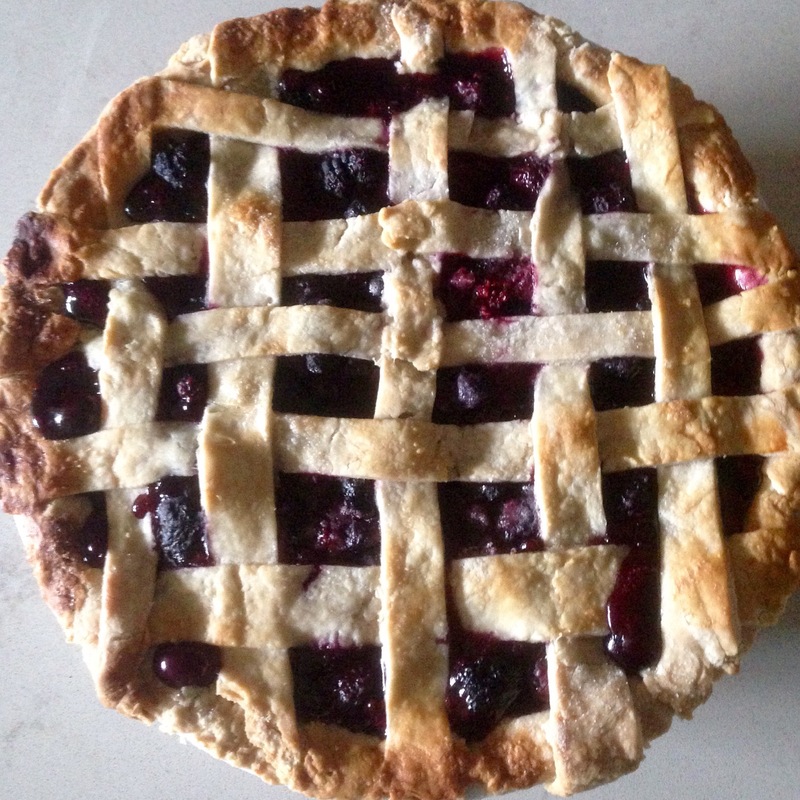 I went for a lattice crust today, so I’ll be explaining how to do that. 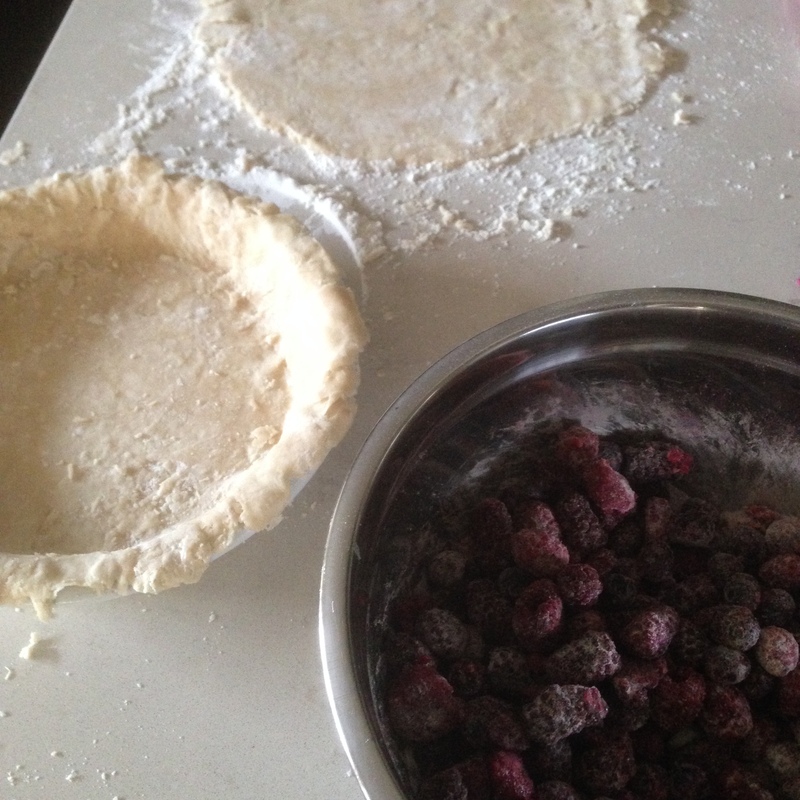 If you just want a traditional pie crust, simply cover the pie with the second rolled out sheet of dough, crimp the edges, and maybe cut a few holes in the middle. For lattice, cut your dough into strips. All in one direction, lay a few strips across the top of the pie pan about an inch apart. To start weaving, fold back every other strip and place a new strip in the other direction starting in the middle. For the next, fold back the alternate strips and place your strip. Just repeat this process across the pie until your grid is achieved. To finish, I brushed the crust with milk and sprinkled on some sugar. Protect your crust by tearing a circle out of the middle of a square of tin foil about the size of your pie pan. Loosely cover the pie in this foil. Bake for 40 minutes, remove the foil, and continue baking for another 25 minutes. Then, just let cool and enjoy! Previous Previous post: Day 40: Wonton Soup! Next Next post: Quick Announcement! Oooooo! I can never refuse a pie with a lattice crust, this is beautiful Mir! And I”m sure it’s awfully tasty, wish I could have a slice now! Gorgeous! It looks like you really perfected this! Aw thank you so much! I’ve never heard it called that before! That’s so cute!